A rally in Copley Square was held to support the lawsuit from Students for Fair Admissions against harvard. Every spring, Harvard mails out thousands of letters to high-achieving high school students across the country, encouraging them to apply for a coveted spot at the Ivy League institution. But documents presented in federal district court Monday allege that Asian-American students must outperform other minorities and, in some parts of the United States, their white peers on standardized tests to land an invitation from Harvard. Students for Fair Admissions, which has accused Harvard of racial discrimination, claimed in court that this lopsided standard was proof that the university penalizes Asian-American applicants in its race-conscious admissions process. But William Fitzsimmons, Harvard’s longtime dean of admissions, disputed that suggestion. Fitzsimmons, the first Harvard official to take the stand in the closely watched trial, said Monday that the difference in test scores reflects the university’s commitment to recruit from a wider pool and extend the university’s reach to black and Hispanic students, and those from underrepresented areas. These recruiting efforts have ensured that Harvard has become a more diverse campus, Fitzsimmons said. A high-stakes case accusing the university of discriminating against Asian-American applicants begins today. The trial, expected to last three weeks, has drawn global attention, as the oldest and most prestigious university in the United States defends its highly selective and often secretive admissions process. The battle is expected to ultimately land at the US Supreme Court and has the potential to change the way selective colleges across the country use race as a factor in admitting students. The courtroom skirmish Monday over who gets an invitation to apply underscores the fundamental disagreements between Harvard and Students for Fair Admissions over what role race plays in the university’s admissions process. According to Students for Fair Admissions, in 2013 a white student in the rural part of the United States was more likely to get an invitation to apply to Harvard with a preliminary SAT score of 1310, whereas an Asian-American woman needed a score of 1,350 and an Asian-American man needed a score of 1,380. Harvard sent out invitations to black and Hispanic students nationwide with base scores of at least 1,100. At the time, the maximum possible score was 1,600, according to court documents. The invitations are an early and commonly used recruiting tool among elite colleges meant to broaden an institution’s base of applicants. The invitations don’t guarantee admission, but they do point to candidates that a college wants to pursue. In its opening statements Monday, Harvard defended its use of race in admissions as legal and crucial to ensuring its educational mission of preparing students for an increasingly diverse and global society. 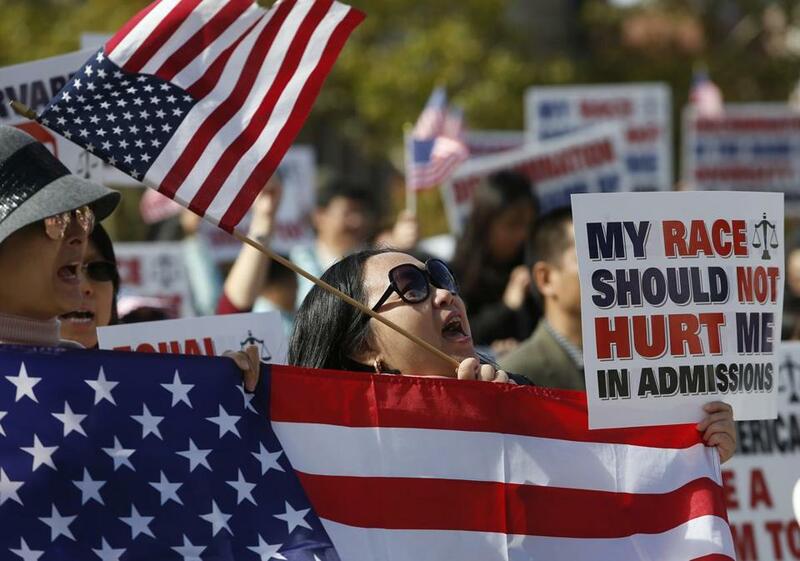 The university denied that it discriminates against Asian-American applicants. Lee, a son of Chinese immigrants, accused Students for Fair Admissions of manipulating statistics to prove its case. “If you torture the data long enough, it will confess to just about anything,” Lee said. The trial is the latest front in the debate over affirmative action in college admissions. The Supreme Court has narrowed the use of race in admissions, but does allow institutions to consider it as a factor among many in evaluating students. Previous legal challenges have focused on whether race-conscious admissions hurt white applicants. Edward Blum, the head of Students for Fair Admissions, backed a previously unsuccessful effort to overturn affirmative action featuring a white student and the University of Texas. But in this case, the organization alleges that six years of Harvard’s admissions data indicate that Asian-American applicants were disadvantaged. Harvard considers personal qualities, such as courage and kindness, along with academics and extracurricular activities, in evaluating students. And Asian-Americans tended to score lower on personal traits, which hurt their chances of gaining admission into Harvard, indicating a bias, Students for Fair Admissions alleges. Harvard University has “let the wolf of racial bias in through the front door,” said Adam Mortara, who gave opening arguments for Students for Fair Admissions. Using spreadsheets and documents, Mortara, a former clerk for Supreme Court Justice Clarence Thomas, argued that Asian-American applicants rated higher than whites in several factors, but dropped in personal qualities. The result, Mortara said, is that there is only one Asian student on campus for every two whites. But ultimately this case could undo years of affirmative action, said Sherrilyn Ifill, president of the NAACP Legal Defense and Educational Fund Inc. The specifics of the lawsuit are about Harvard, an institution that enrolls only about 1,600 freshmen from a pool of more than 42,000 applicants every year. But many of the country’s most elite universities use a similar approach to Harvard’s in evaluating potential students for their freshman classes. If the case reaches the Supreme Court, it could offer opponents of affirmative action an opportunity to limit race-conscious admissions in higher education more broadly. 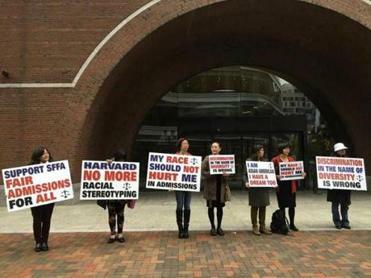 Students for Fair Admissions wants Harvard to adopt race-blind admissions, a system the university’s experts say would benefit white students the most and marginally improve admissions of Asian-Americans. But it would drastically reduce the share of black and Latino students on campus, Ifill said.